-Portrait of Richard Neville, 1964-65, enamel on canvas on panel, 156 x 107 cm. Collection: Queensland Art Gallery, Brisbane. -Garry Shead painting of Wahroonga Lady in her Naked Lunch, 1965, oil on canvas on board, 92 x 122 cm. -Garry Shead oil painting titled A Blind Eye in Nelson St, Gordon, 1966, oil and enamel on canvas, 92 x 120 cm. – Green gate Summer, 1966, oil on board, 62 x 60 cm. oil and enamel on board with collage, 60 x 62 cm. oil and collage on board, 72 x 62 cm. oil and enamel on canvas, 130 x 78 cm. oil on canvas, 120 x 92 cm. 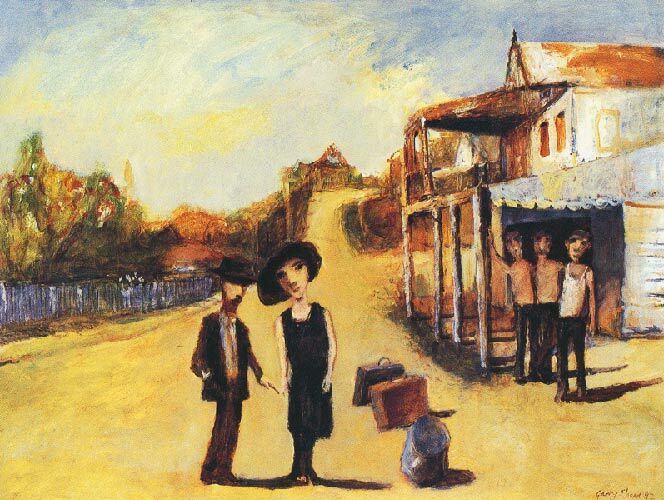 -Garry Shead Sydney art work titled Lane Cove Mystery, 1967, oil on canvas, 92 x 76 cm. plastic doll, 55 x 80 cm. oil on canvas with plastic dolls, 92 x 120 cm. oil on canvas, 121 x 92 cm. oil on canvas, 90 x 65 cm. oil on canvas with mixed media, 80 x 80 cm. 101.4 x 81.4 cm, 101.5 x 81.3 cm. Water colour, 30 x 20 cm. oil on board, 92 x 121 cm. oil on canvas, 120 x 182 cm. oil on canvas, 120 x 81 cm. oil on canvas, 120 x 184 cm. oil on panel with gold leaf, 210 x 210 cm. oil on panel with gold leaf, 210×210 cm. oil on board, 90 x 90 cm. -Melissa and Threat, 1976, oil on canvas, 92 x 67 cm. oil on canvas, 167 x 230 cm. oil on canvas, 170 x 190 cm. oil on canvas, 122 x 152.5 cm. -Waters of Transfiguration, 1980-81, oil on canvas, 120.5 x 150 cm. oil on board, 92 x 122 cm. -Unbroken Horse, 1987, oil on board, 92 x 121 cm. oil on board, 77.5 x 93 cm. oil on board, 103 x 134 cm. -Stockman’s Dream, 1988, oil on canvas, 120 x 152 cm. oil on board, 92 x 92 cm. oil on canvas, 76 x 92 cm.